(CNN) - Tennessee Gov. 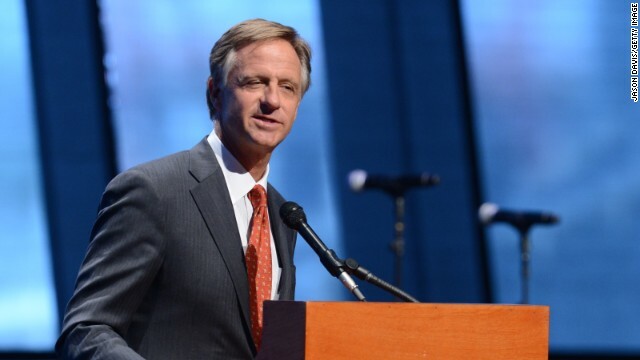 Bill Haslam expressed frustration with the Obama administration’s decision to place 760 unaccompanied minors in his state without notification. In a letter addressed to President Barack Obama dated July 25, Haslam said it was “unacceptable” that the state discovered the presence of the unaccompanied minors through an online posting by the Department of Health and Human Services. A spokesman for Haslam said Tuesday the governor has not been notified by the administration. HHS said it would review the letter and respond to the governor as soon as possible. Haslam, a Republican, said he raised the issue of the border crisis, which has seen thousands of unaccompanied minors cross the southern border, two weeks previously at a meeting of the National Governor’s Association with HHS Secretary Cynthia Burwell and asked to be directly informed of any relocation of unaccompanied minors to his state. He is primarily concerned about the burden the unaccompanied minors will place on the state’s resources. The letter also emphasized Haslam’s concern about the health status of the children relocated to Tennessee, the immigration status and screenings of the children’s sponsors, and how long the children are expected to stay in his state. Other governors have expressed similar concerns about the placement of unaccompanied minors in their states. The day before Haslam sent his letter to the President, Georgia’s Gov. Nathan Deal sent a similar letter calling it “unconscionable” that the federal government “failed to pick up the phone, email or send a letter” informing the governor of the presence of unaccompanied immigrant minors in his state. Notably, Maryland Gov. Martin O’Malley, a Democrat, engaged in a public spat with the White House about the placement of minors in a facility in western Maryland, which eventually was taken off list of sites HHS was considering. Cal, look at the bill, and why no vote? You tell me, what is the holdup? conspiracy theory: Obama is secretly shipping illegal immigrants as he pleases throughout the country. big business choose not to do so! Hello everyone. The 2008 law that Tampon Tim refers to was indeed signed by Bush. It was also passed with unanimous approval by both houses. Everybody jumped in the pool together on this one. And let's not forget that O'Malley of Maryland (D) was the first to say "not in my back yard". Neither party has bathed themselves in glory on this one. And why is it wrong for any governor to want to be informed of the placement of illegals in his/her state? Oh, and one small point, Maryland isn't "hosting" any of these people, but that's different isn't it @rs???? He writes Obama, YOU GOT TO BE KIDDING ME !!!!!!!!!! Who on earth is running to replace this guy??? Whomever it is, good luck !!!!!! I can't answer this, but I can tell you what he wouldn't do. He wouldn't chew his nails, what with them being embedded in a cross. PLEASE stop complicating these people’s objections with your simply stated FACTS! Facts have nothing, absolutely nothing to do with their refusals and their objections, including the shocking objection of my own Maryland Democratic Governor O’Malley. You know and I know, and everybody knows that this is just another GOPer opportunity to dog-pounce on the Prez, blame him for something that is not of his own doing, and trying to turn folks against him just in time for the 2014 elections. So stop confusing everybody with straight and simple facts and let the willfully simple-minded continue with their depravity and cold-heartedness as it concerns these children and the President..
Is he up for re-election? It's your Federal Government at work! And, just so you know, Obama and your Liberal Buddies aren't going to deport any of these Border Jumpers! And guess who get's the Bill? YOU !!! Have fun! !